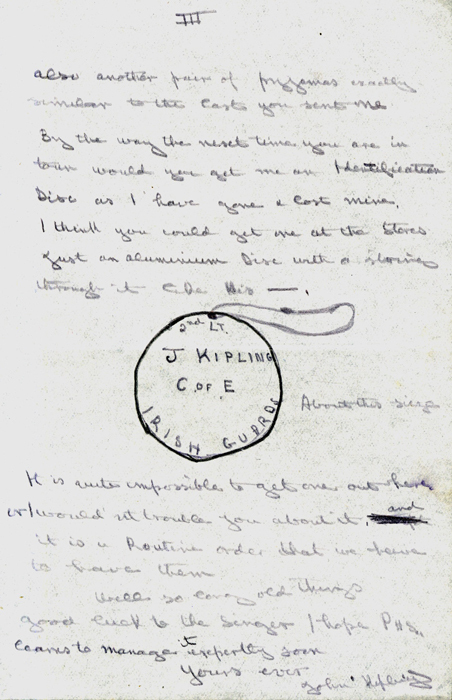 John Kipling, son of Rudyard Kipling, was killed at the Battle of Loos in 1915. 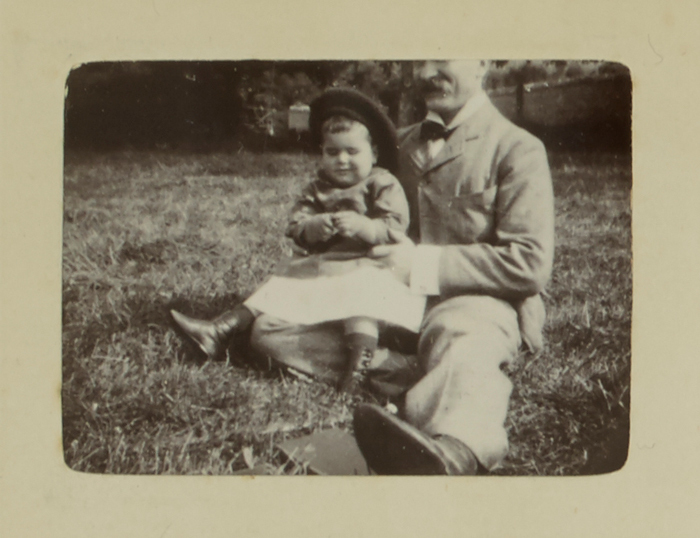 Born on the 17 August 1897, John was the only son of the famous British writer Rudyard Kipling and his wife Caroline “Carrie” Starr Balestier. 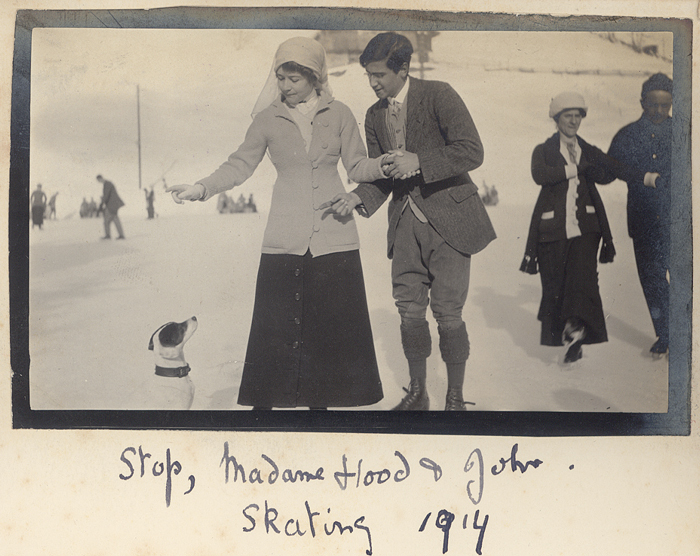 John was born at the family’s residence in Rottingdean before they relocated to Batemans House, also in East Sussex, in 1902. 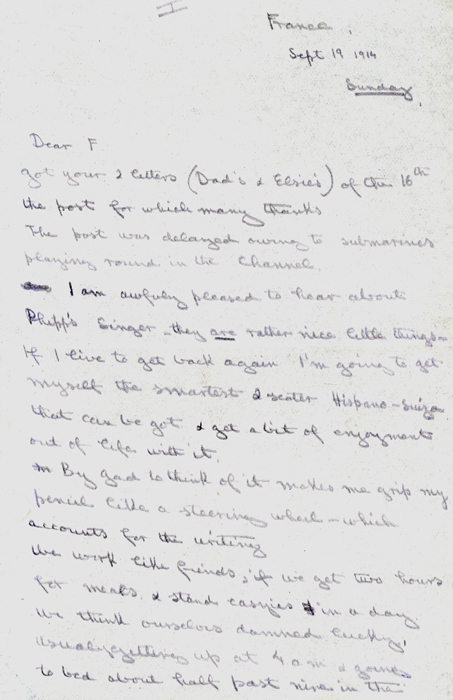 Father and son had a very close relationship, with John often being thought the inspiration for Kipling’s famous work ‘If-‘. 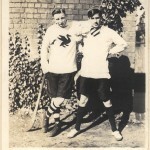 This closeness extended to the period where John boarding at Wellington College. The outbreak of the First World War was seen by both men as a great opportunity. Rudyard Kipling had long been noted for his support of Britain and its Empire and, at the outbreak of war he was one of many notable writers and poets to join the newly formed War Propaganda Bureau (WPB). The WPB produced numerous posters and leaflets designed to galvanise the British public into supporting the war effort and, where necessary, to volunteer for military service. 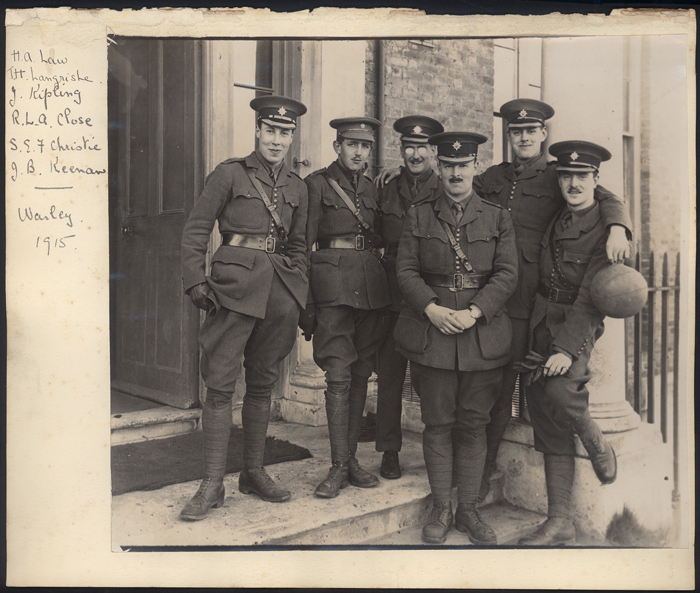 The desire for men to enter military service did not simply exist outside of the Kipling household. Upon Britain’s entry to the war, John almost immediately attempted to join the Royal Navy. However, he was rejected because of his poor eyesight. Rudyard himself was notably short-sighted and John appears to have inherited this trait. 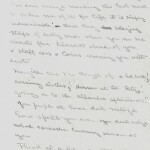 Indeed it was said he had trouble reading the second line of letters on an eye chart even when wearing his glasses. When the Navy rejected him, John and his father then attempted to join the Army only to be rejected for the same reason. 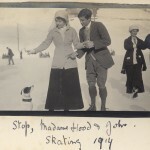 With John’s route into the army being blocked and with Rudyard increasingly keen for his son to participate in the conflict, he took matters into his own hands. Already having a great deal of influence from both his pre-war writing and in his role with the WPB, Rudyard called upon his friendship with Frederick Roberts, who, among his other titles and honours, was a colonel in the Irish Guards. Shortly afterwards, John was commissioned as a Second Lieutenant in the 2nd Battalion of the Irish Guards having just turned 17 years old. 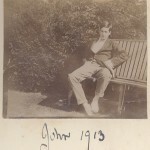 The day before his 18th birthday, and having completed his military training, John and the rest of his Battalion were sent to France. 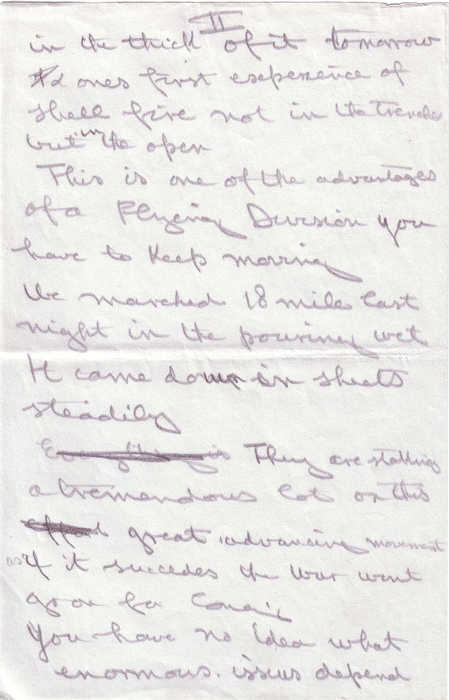 John continued to correspond with his father during his time in training and following his deployment to France. Then, the letters stopped. 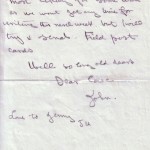 On 2 November, Rudyard and Carrie received an official telegram from the War Office informing them that John was missing in action. The Conservative politician, Andrew Bonar Law, reported that Rudyard gave a ‘curse like the cry of a dying man‘. John had arrived in France as he turned 18 years old and, he and the rest of his men were bound for the British trenches near Loos. Much of the British fighting so far in the Spring of 1915 had been small-scale and localised. The huge preparations ahead of the Battle of Loos led to the coming attack being referred to as ‘the big push’. The French Army had grown in size since the outbreak of the war and they were eager to stage a joint attack on the Germans whilst they still held a manpower advantage. 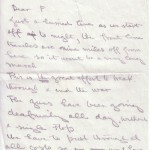 However, battle plans were hampered by the onset of rain on 1 September 1915 that did not stop. By the later weeks of September, the ground had become heavily waterlogged and the weather showed no signs of improving. The British made its first attack with poison gas on 25 September when it released a cloud of chlorine in the direction of the German trenches. This cloud did not behave as hoped and in many places simply hung in the air in No Man’s Land or, when the wind changed, was redirected back towards British trenches. 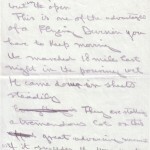 The following day John Kipling arrived in the trenches of the front line. The day afterwards he would go over the top. 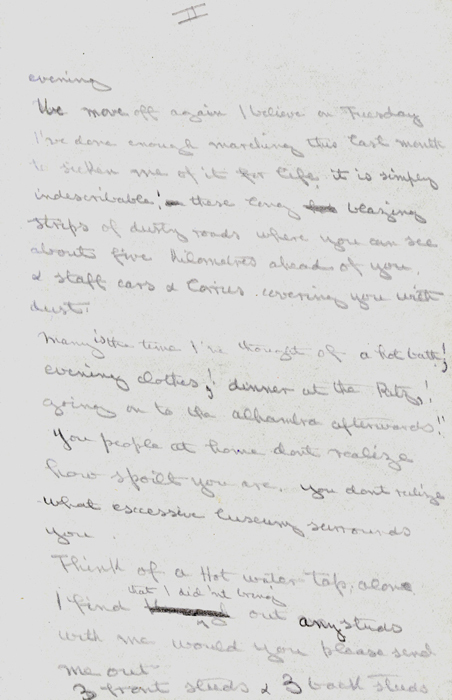 One of John’s last letters to his parents was dated 19 September 1915 (although John has mistakenly labelled it as 1914) and made various mention of his time in the army and how he missed some of the comforts of home, such as a regular bath. It is quite impossible to get one out here or I would not trouble you about it, and it is a routine order that we have to have them. John even included a small sketch of an identification disc to illustrate what he required. Identification discs in the First World War served the same purpose as ‘dog tags‘ did in later conflicts. If anything were to happen to the wearer of one, they would be easily identified by the information on the disc. However, when John went over the top on 27 September he had no identification disc upon his person. 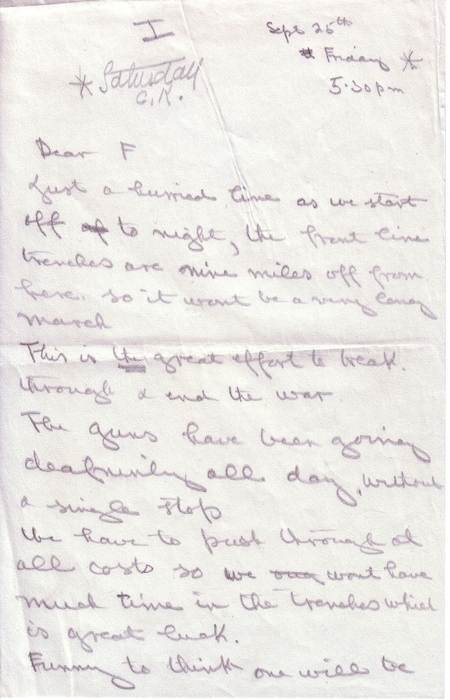 What happened next during the attack at Loos remains complicated and uncertain. 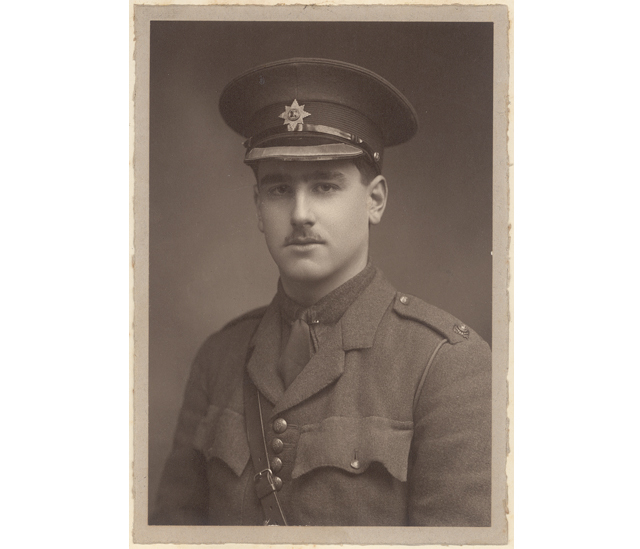 John and his men left the trenches just after 4pm and some eyewitnesses reported seeing him and another officer, 2nd Lieutenant Clifford, leading men forward towards a church. Both men were apparently then shot and, at the very least, wounded with Clifford’s body being found later on. The last reported sighting of John suggested he had also received an horrific facial wound from an exploding artillery shell. After this he was never seen again and his body was never found. Neither Rudyard nor his wife were prepared to accept that John had fallen at Loos and, instead, embarked on a four-year long hunt for information as to his whereabouts. The absence of his body meant that he was not going to be confirmed killed and would stay ‘missing’ until new information arose. It was also not unusual for men to be reported missing after an attack only to show up later on in hospitals, other British trenches or, indeed, in German captivity. Rudyard once again used his influence to arrange for interviews with John’s comrades and even to organise airdrops of pamphlets over British and German trenches seeking information on his whereabouts. 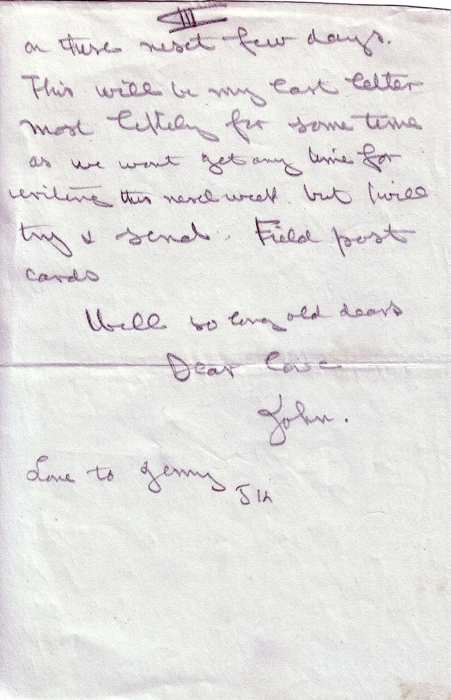 He also found himself inundated during the war with letters from serving soldiers on a whole range of issues relating to the war in general to scattered details about John’s last days before the attack. Rudyard also made numerous visits to the Western Front both during the war and in its immediate aftermath to try and find news. 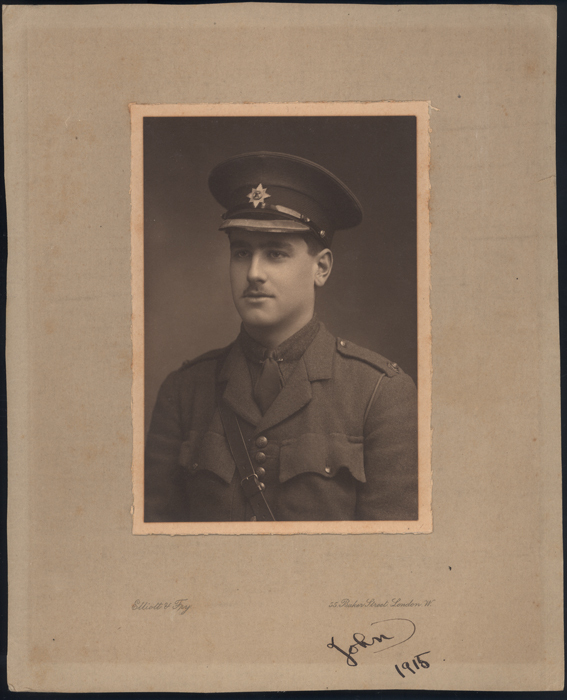 However, by April 1919, Rudyard finally informed the War Office that with no sign of his son having survived Loos, his record should be updated to reflect his death. The effect of John’s death on Rudyard was both complicated and consuming. Many said that he was never the same again following the loss of his only son. Following news that his son was missing Rudyard wrote the famous poem’ My Boy Jack’ which, whilst although it is about a missing sailor, is often seen as representing his turmoil at the disappearance of his son. However, despite the loss of his son Rudyard continued to work for the war effort throughout the conflict. In the aftermath of the armistice he became the literary advisor to the newly formed Imperial War Graves Commission, which would be renamed as the Commonwealth War Graves Commission in the 1960s. In this role Rudyard would create many of the inscriptions seen within the cemeteries for Britain’s war dead. Rudyard would also write the official history of the Irish Guards, John’s regiment. 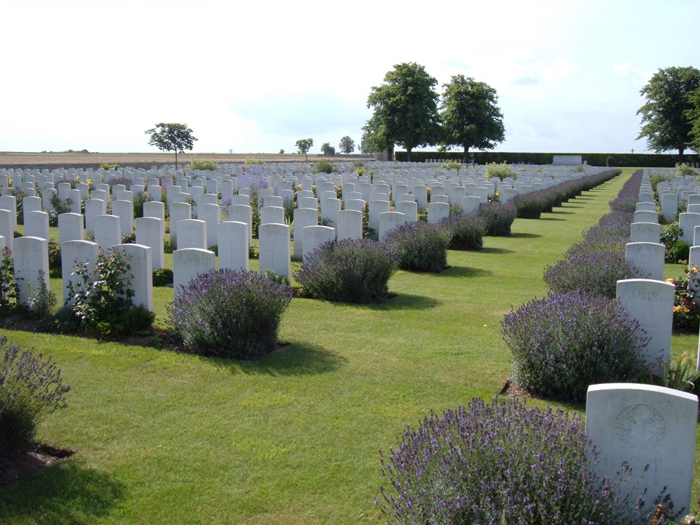 Both of John’s parents would continue to make trips and visits to the Loos battlefield in their ongoing attempt to locate their son’s body but they were unsuccessful. Rudyard died in January 1936 having never found John’s body. In 1992 it was reported that the body of an unidentified Lieutenant previously buried in a grave for an Unknown Soldier, which had been located in the St Mary’s ADS Cemetery in Haines near Loos, was now thought to be that of John Kipling. Following this apparent confirmation, the headstone for the grave was replaced and John’s information installed in its place. However, there remain strong doubts over whether or not this identification was accurate. It has been suggested by some historians that the grave actually belongs to another man; Lieutenant Arthur Jacob. The evidence for these claims often points at the distance between this cemetery and where John had been fighting on the day of his death but also, and more importantly, a discrepancy in rank. John had initially been commissioned as a 2nd Lieutenant in the Irish Guards. At the time of his death he was in the process of being promoted to a full Lieutenant but that increase in rank does not appear to have yet been confirmed. Therefore, if this was the case, the day John went over the top at Loos he would’ve been wearing the rank identification of a 2nd Lieutenant, whereas the man in the now marked grave was a full Lieutenant. Since 1992 the Commission has received an increasing number of requests to identify previously unidentified casualties and has concluded that the Commission’s member governments should have responsibility in matters relating to the identity of their respective war casualties. It was therefore agreed that the case of Kipling should be referred to the British Government (Ministry of Defence) for its views in relation to the original case and the additional material supplied by the Holts. In August 2001, the Commission asked the Ministry of Defence to re-examine the evidence. The Ministry of Defence considered that evidence and believes that the grave is that of Lt John Kipling. A statement to that effect was issued in June 2002. 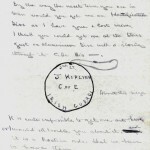 More recently, and given the approaching centenary of John Kipling’s death, the Commission undertook a complete review of the case – examining original records as well as the original identification submission in 1992. It also consulted a number of external record sources. The debate over who lies in the grave marked as John’s continues and it is unlikely to be concluded without some form of future DNA test. However, ongoing research into the matter may soon hopefully shed further light on the topic. However, it does add to the mystery and the memory of what happened to John Kipling, son of Rudyard, the day he went over the top at Loos and disappeared. 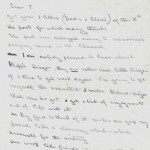 The National Trust deposited the main Kipling Collection at the University of Sussex in 1978 and the records relating to John Kipling, along with many other documents and records relating to Rudyard himself are available to be viewed at The Keep. Furthermore, Bateman’s House, the home of John and Rudyard remains open for visitors wishing to learn more about the Kiplings. 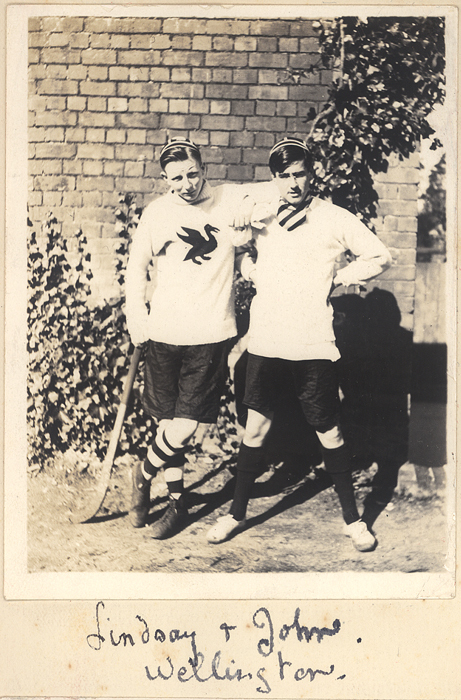 The images of John and Rudyard in this article are reproduced following kind permission from the National Trust.